When this Brooklyn Hip Hop trio emerged in 1992 with a unique style that combined high-speed rapping, dancehall chatting, and backward rhymes with Looney Tunes-inspired voice impressions and craftily arranged grooves, the Rap world had never heard anything like it. Following up on their debut F.U. 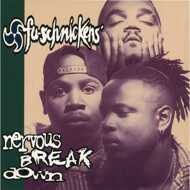 : Don't Take It Personal, Nervous Breakdown (1994) proved that the Fu-Schnickens could deliver the goods.